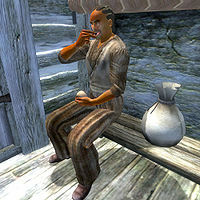 Ernest is a Redguard commoner who tends the horses at Horse Whisperer Stables outside Anvil. His wife, Clesa, is the person to talk to if you want to buy one. Ernest spends most of his time tending the horses, while scouting the Gold Road for potential customers. He sleeps inside the stable building every night between 10pm and 6am and always spends the first two hours of the day strolling around outside. At 8am, his workday begins, and he starts raking the ground inside the corral. He stops at noon and sits down on the bench near the stable door for a two-hour lunch. He gets up again at 2pm and spends all afternoon wandering around near the stables. At 6pm, he once again sits down on the bench, this time for a two-hour dinner. At 8pm, with the stables closed and not much to do, he just loiters lazily around the pen until he goes to bed at 10pm. The one exception to this schedule occurs if you purchase a white horse from Clesa; Ernest will then wait next to the horse until you mount it. Ernest wears a modest lower-class outfit consisting of a coarse linen shirt, coarse linens, and a pair of rough leather shoes. He carries a small amount of food, gold, and his rake. While his wife seems overly happy about the business and will say: "My husband and I run the Horse Whisperer, the finest stables in Anvil County. ", Ernest will be less impressed: "If you are looking to buy a horse, go inside and talk to Clesa." His bad mood seems to have been caused by an ill-advised career change: "I used to be a knacker. That's how I fancy my horses. Ripe, stiff and silent. Hate it when they stare at me. Dumb beasts." If you buy a horse from Clesa, she will send you back outside: "Wonderful! Go out front. Ernest will have the White saddled and ready for you." Ernest will then break off his schedule and wait for you outside the stables, with a horse by his side. When he sees you, he will say: "I've got your horse saddled and waiting for you." If you manage to speak to him before hearing this comment (see bugs) he will instead say: "This is one of our finest White horses. Take good care of him." When you mount the horse, he will return to his usual routine. Ernest was evidently one of the victims of The Siren's Deception. You can find his fancy pants, his best shirt and his shoes at the gang's hideout in Gweden Farm. However, you cannot return the items to him. Another, more bitter greeting was recorded for Ernest but will never be heard in-game: "I'm Ernest. This is the Horse Whisperer, Anvil's only stable. Park your nag here, or leave him for the wolves. Your choice." Due to an odd script, only one of Ernest's two post-purchase dialogue lines can be heard, and only once. Esta página foi modificada pela última vez à(s) 01h15min de 24 de julho de 2015.